Sometimes as a Photographer you are asked to, how do I put this, improve on reality. Sometimes you just want to create the image in the camera that gives the viewer a better sense of what is really there. 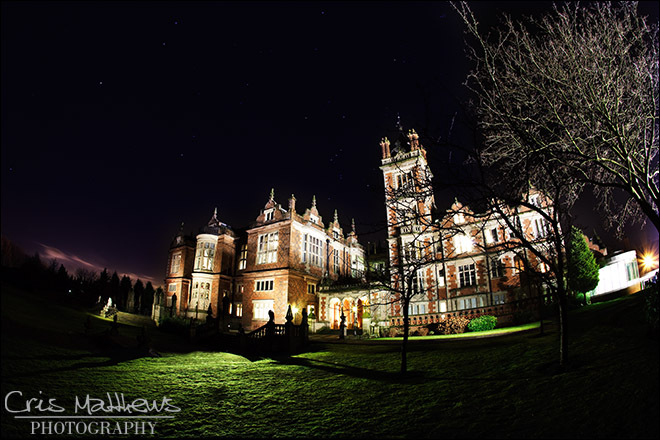 Recently we photographed Caroline & Anthony’s Wedding at the magnificent Crewe Hall. 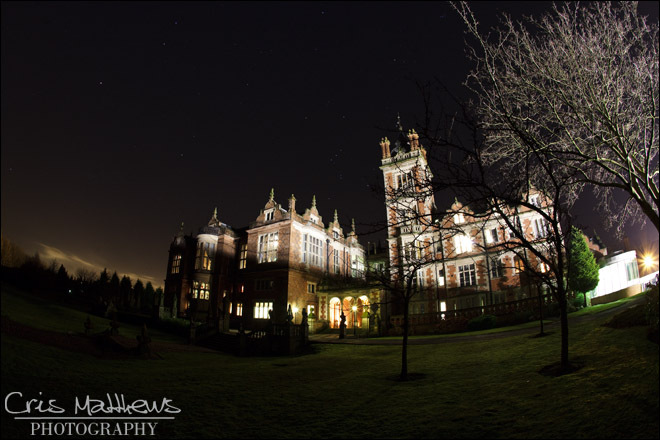 I always like to take an external shot of the venue at night and I had been looking forward to taking this one for a while. I am putting the finishing touches to the pictures and thought I would share a little insight into how an image is created. …It’s not lit!. There is light spilling onto the top half of the building from the adjacent complex but it’s hardly a flattering light. This is also the side where the room where the reception was going on, and I always like to include that if I can. So what is a Photographer to do ??? This is the point at which you have to go digging around in your creative mind and come up with something you’ve never tried before. After being stood there for a couple of minutes I came to the conclusion this shot was too good to miss and I would just have to light the entire rear of the building somehow. I picked my vantage point, I liked the trees silhouetted against the building giving it a nice wintery feeling. I did give some thought to using my flash guns, but they would give a very cold light and would be difficult to control, so I decided to give my trusty old 12v Video Light a go. This is what I really love about Photography, there is always something new to try. In total we spent 20 minutes outside and created some really unique images. I think this is going to look amazing in the Album. Magic!